Nationwide, blacks comprise 62 percent of drug offenders admitted to state prison. In seven states, blacks constitute between 80 and 90 percent of all people sent to prison on drug charges. Nationwide, black men are sent to state prison on drug charges at 13 times the rate of white men. Two out of five blacks sent to prison are convicted of drug offenses, compared to one in four whites. Black men are incarcerated at 9.6 times the rate of white men. In eleven states, they are incarcerated at rates that are 12 to 26 times greater than that of white men. Nationwide, one in every 20 black men over the age of 18 is in prison. In five states, between one in 13 and one in 14 black men is in prison. One in every 20 black men over the age of 18 in the United States is in state or federal prison, compared to one in 180 white men. 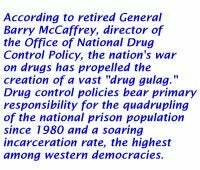 More people are sent to prison in the United States for nonviolent drug offenses than for crimes of violence.